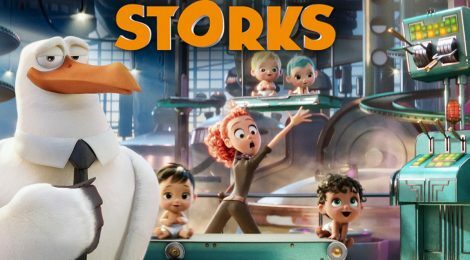 Movie Review - Storks - Honk if you love justice! We saw Storks at a preview screening, and it had some really cute parts and fun actiony bits. However, I think they just had no idea how to start the movie to get to those bits and just decided to use the “I’m giving you the company as long as you don’t screw up this one final task” trope. Throughout the movie characters keep asking Junior (the star that’s a stork, voiced by Andy Samberg) why he wants to be the boss, and he doesn’t know. I don’t think the filmmakers did either. Once they get past that part, the movie is fun. Basically, storks used to deliver babies made in a magical device, but now people get their babies some other way. Yeah, it’s strange. Now storks deliver packages for an Amazon clone. Tulip is the one human on Stork Mountain, a failed delivery after the stork assigned to her ‘fell in love’ with the cute little baby and refused to fulfill his duty. She’s a free spirit, but doesn’t fit in despite her best efforts. Tulip accidentally makes a new baby after getting a letter from a kid who really wants a baby brother (who has a whole subplot about busy parents reconnecting with him), and Junior and Tulip go on an adventure to get the baby to her family. I normally wouldn’t have been that detailed about the plot but I feel like the commercials and early trailers didn’t really give you any idea what the movie was about. I enjoyed it, all of the principal cast did a solid job with the voices, including Key and Peele as a pair of wolves that want to take the baby to raise as their own. But there is one character so bad that it came way too close to ruining the movie – Stephen Glickman’s “Pigeon Toady”. He speaks with an extremely annoying ‘Dude, braaaaah’ affectation that I don’t think one person found funny. I never understand how a character that poorly made gets past everyone that sees the movie before release. Storks has some funny bits and some heartwarming bits, but wasn’t a home run. If your kids want to see it, there are worse ways to spend an afternoon, but it’s not required viewing. If you do go, plug your ears whenever the pigeon is talking.